How can you enjoy Saint Patrick's Day in the United States without corned beef and cabbage? Aside from being utterly delicious, the truth is that this dish is about as American as you can get – it didn't originate in Ireland, but rather in New York City! If you take a trip to Ireland, you'll be hard-pressed to find "corned beef and cabbage" sold as a dish anywhere there. Rather, Irish immigrants in New York City borrowed the recipe for corned beef from their Jewish neighbors, and used that as the basis of the traditional Saint Patrick's Day feast. Regardless of its origins, a hearty pot of corned beef and cabbage is a treat that is hard to pass up…especially if you make it yourself. This recipe is the result of my preparations for Saint Patrick's Day in 2013. I went all-out this year, corning my own brisket and devising a method to bring extra flavor to the cabbage. Even though everyone enjoys corned beef and cabbage, what tends to happen in many homes is: everyone finishes off the corned beef, but no one eats the cabbage. Maybe they nibble at the cabbage in order to say they've eaten it; but cabbage has a (well-deserved) reputation for being bland and tasteless. It needs to be spiced in order to be more appealing and palatable…so, that's what I did. I hope you enjoy this method, and have yourself a healthy and hearty March 17th. I began brining the corned beef a full two weeks before cooking it, though you don't have to start that early. One week, or five to ten days, is the usual amount of time taken to produce a fully brined corned beef brisket. If you can get a whole beef brisket with fat cap (the layer of fat underneath the meat), then this is the best choice. When cut into portions, the brisket is separated into the flat cut and the point. Flat brisket is considered the higher quality meat: it's more tender and less resistant to cooking, especially if you want a faster cooking brisket. Point brisket is perfectly acceptable for slow-cooking, as it will be tender enough to pull apart after several hours in the oven (or smoker) at low temperature. Point brisket can still work with barbecue and other kinds of fast cooking; however, it gives a tougher meat than the flat cut. About nitrates: Saltpeter is traditionally included in the preparation of corned beef, as a preservative. This dish was developed long before the invention of refrigeration, and this is why preservatives like saltpeter were needed when the beef was brined for days at a time. If you choose not to use nitrates such as saltpeter or curing salt, the beef will take a grey color rather than pink. However, it will taste just fine. Many local markets sell grey corned beef, prepared without nitrates. Be sure you're using saltpeter or a curing salt. The package doesn't have to say "pink" curing salt, but it must say "curing." There's a fancy Himalayan "pink salt" sold at TJ Maxx and natural food stores, but this is just a fancy table salt; that's not "curing salt." This dish will work fine without saltpeter or curing salt. If you want the pink color but don't want to use nitrates, you can use 1/4 cup of beet juice to color the meat. 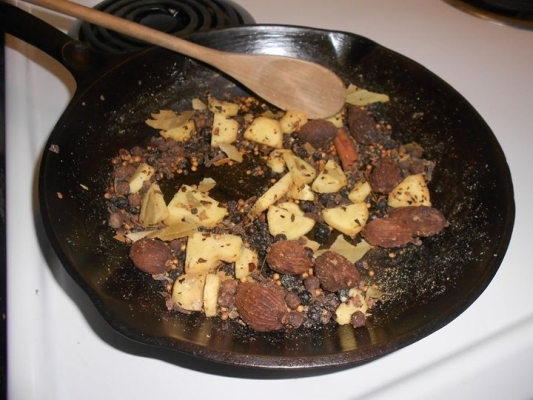 Mix the pickling spices together in a cast iron skillet. Heat them at low to medium until they are toasted and fragrant. Remove from heat and pour the spices into a small bowl. Remember, some of these spices need to be stored away in the refrigerator, to be used when cooking the corned beef several days from now. 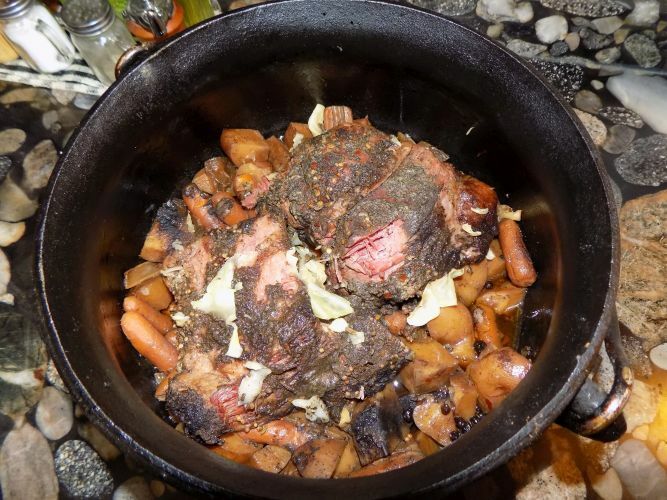 Many folks simply boil the brisket and vegetables, but few things in life can compare to the wonderful taste of beef brisket slow-cooked in a cast iron pot for several hours. We don't have to cover this with water. We use beer or ale to add flavor to the brisket, but that's all the liquid we need. The meat and vegetables will render their own liquid as they simmer for several hours at a temperature just above the boiling point of water. Chop up potatoes, carrots, onions, and celery into large pieces; add them to a large cast iron pot. 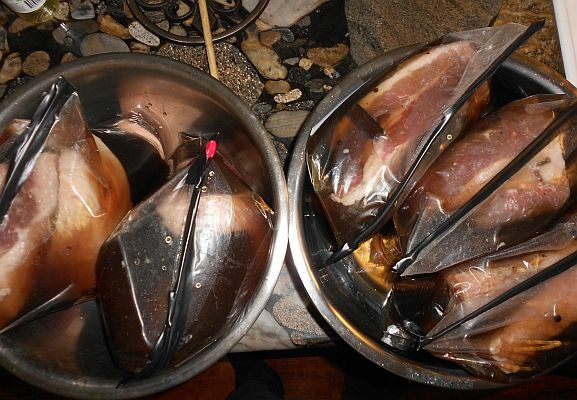 Remove beef brisket from the brining bag, and discard the brine. 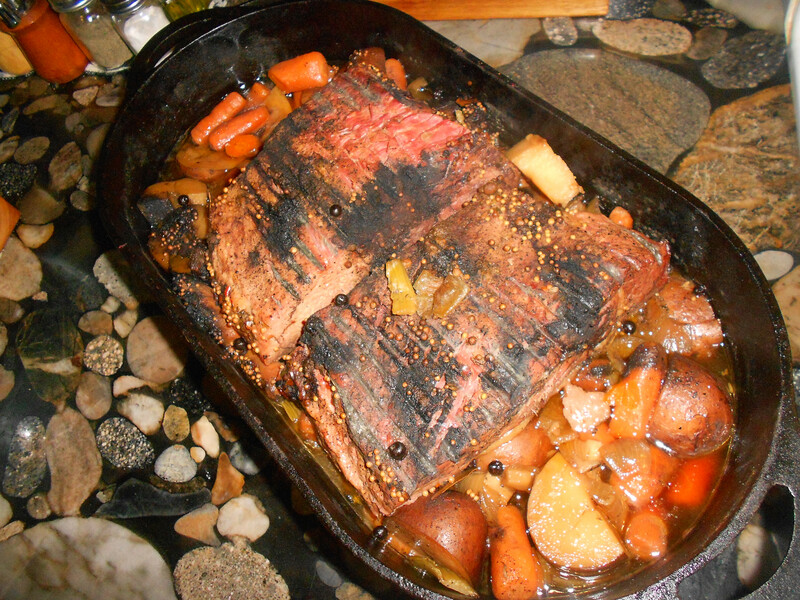 Rinse off the brisket, then place it in the cast iron pot on top of the vegetables. Pour the beer over the brisket. Add your additional spices, sprinkling them on top of the brisket. Add kosher salt, black pepper, and two bay leaves. Cover the pot with a heavy iron lid, and cook it in the oven at 250 degrees F for six and a half hours. After about six and a half hours, begin preparing the cabbage. Remove the cabbage heart, chop up the cabbage, and add it to the large bowl. 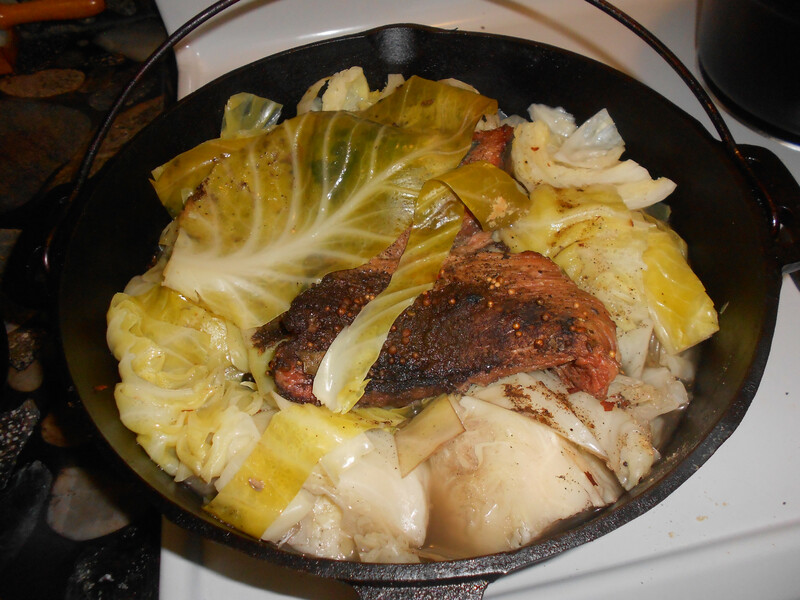 Take the pot out of the oven, and empty the cabbage on top of the beef. Cover the pot once again, and cook it all in the oven for another hour and a half (90 minutes). This gives a total of eight hours cooking time. By this time the cabbage will be thoroughly cooked; but it will still have some body and not be completely dissolved into mash. Corned beef and cabbage are usually served with black pepper, horseradish, vinegar, mustard, and Worcestershire sauce. Once you've brined your own corned beef brisket, you'll never again be satisfied with corned beef purchased from the store. However, I'll gladly be honest and agree that there's nothing really wrong with making store-bought corned beef brisket. One reason why corned beef is such a popular dish is because it tastes so good, along with being easy to make. (Homemade corned beef is simply far better.) But if you want to kick your store-bought corned beef up a notch, here's a suggestion: don't be satisfied with that miniscule and microscopic spice pack that comes with the corned beef. Add your own spices along with the spice packet, and slow-cook the brisket rather than boiling it. You'll wind up with a beef brisket that is so tender, you won't need to use a knife at all to cut it. It will simply fall apart, and you can serve it with tongs or a spatula. What's more, the flavor will b e out of this world! The spice packet typically contains a very basic spice combination of black peppercorns and coriander seeds. Some might have other ingredients as well. Listed above are some suggestions on spices you can use to spice up your corned beef. Add any or all of these spices to the pot. 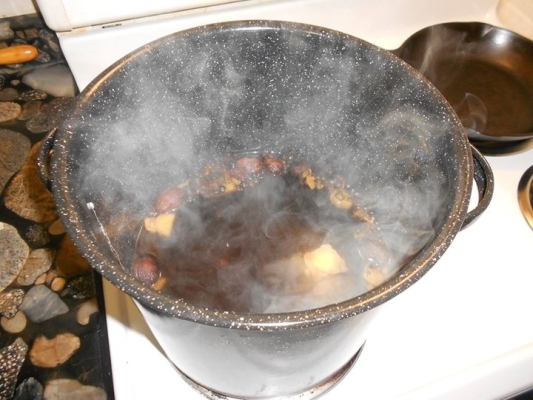 And rather than using plain old water, add a bottle of dark beer or ale to the pot as well. Whether you boil your corned beef or slow-cook it in a crock pot (or a cast iron dutch oven! ), this simple addition will take your corned beef to the next level and give it an additional flavor you won't soon forget. Cater to your taste, because of course you're the one eating it. Above all, be bold and have fun! And the fun isn't over yet! When dinner is finished and the corned beef is gone, or almost gone, chances are there will be a large amount of leftover vegetables…boiled and soggy potatoes, carrots, celery, and perhaps even some extra corned beef. Store these vegetables in the refrigerator overnight and let them turn into a big, cold lump of mash. The next morning you'll be able to prepare and serve Corned Beef Hash…also known as Bubble and Squeak!